MacKay Corporate Insurance Brokers, based in Ayr, has become the 6th insurance broker in Scotland to achieve Chartered Broker status. The status, awarded by the Chartered Insurance Institute, recognises general insurance brokers for their professionalism and commitment to qualifications in the insurance sector. The status was acknowledged by industry leader Eric Galbraith, chief executive of the British Insurance Brokers’ Association, who visited MacKay’s to welcome their achievement and dedication to professionalism and training. The British Insurance Brokers’ Association (BIBA) is the UK’s leading general insurance organisation representing the interests of insurance brokers, intermediaries and their customers. BIBA membership includes 1700 regulated firms. Insurance brokers and intermediaries distribute nearly two-thirds of all UK general insurance. In 2007, insurance brokers and intermediaries generated £1.5 billion of invisible earnings, and they introduce £22 billion of premium income into London’s insurance market each year. BIBA is the voice of the industry, advising members, the regulators, the Government, consumer bodies and other stakeholders on key insurance issues. BIBA provides unique schemes and facilities, technical advice, guidance on regulation and business support and is helping to raise, and maintain, industry standards. BIBA works closely with the Chartered Insurance Institute to provide training to those working in the industry and actively participates in helping the industry and its customers deal with some of the major issues of the day. BIBA members provide professional advice to businesses and consumers, playing a key role in identification, measurement, management, control and transfer of risk. They negotiate appropriate insurance protection tailored to individual needs and operate to a very high standard of customer service with the aim of ensuring peace of mind, security, financial protection and the professional advice required. MCIB is a leading corporate insurance broker based in Ayrshire. MCIB was established in 1989 and has grown to become one of the top 10 leading independent brokers in Scotland. The aim is to look after their clients' insurance requirements, and design a programme that protects their assets revenues and liabilities. MCIB prides itself on customer service, with every client having a key personal contact to look after their insurance programme. MCIB strives to be at the forefront of the insurance broking sector, and believes that the commitment shown in achieving Chartered Status is reflective of how the business is run. 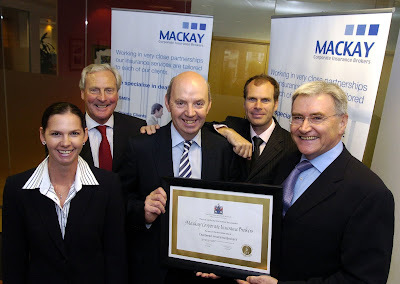 MacKay Corporate Insurance Brokers are founder members of the Elite Ayrshire Business Circle. There are currently 598 Ayrshire business stories permanently archived on this site. To locate those of most interest to you, please use the site search facility in the top left hand corner of this page. Type your search term in the white box, then click “SEARCH BLOG”.